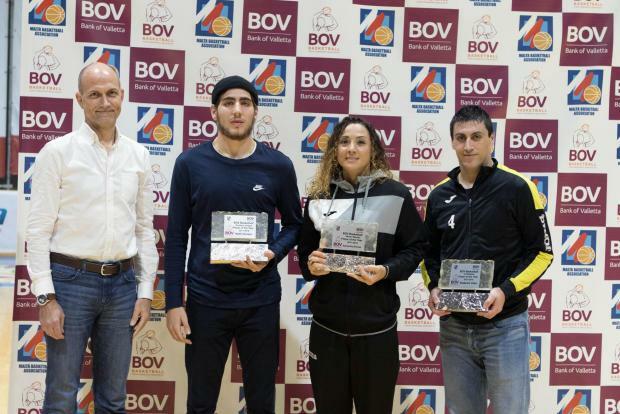 The BOV Basketball Players of the Year for season 2017/2018 were announced during a ceremony held at MBA Basketball Complex in Ta’ Qali. The awards were presented by Malta Basketball Association president Paul Sultana and Bank of Valletta Chief Officer Peter Perotti. The BOV Basketball Player of the Year award is the highest honor that an individual can receive for their on-the-court efforts as well as exemplary behavior and team-spirit in local basketball. Speaking during the awards presentation, Malta Basketball Association president Paul Sultana said: "This award only goes to one player and it is typically one who showed not only the ability to be an excellent player but one who worked for his team and helped his team-mates performance." "It is an honour to be in the presence of Malta’s top talent, from the younger categories to the top flight of Maltese Basketball’ said Peter Perotti. "As the major supporter of sporting initiatives in Malta, we are very proud to be associated with this initiative that awards performance excellence among our top players."